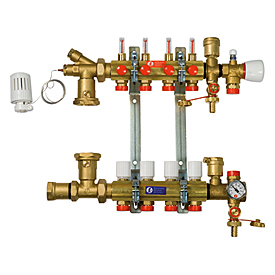 Preassembled manifold with thermostatic fixed point regulation for HVAC systems. With flow meters (scale 0,5-5 l/min). Mixing obtained through R462L thermostatic head. Optionally is possible to replace the handwheels with R478, R478M, R473, R473M thermo-electric actuators. Outlets with base adaptor connections. Use key R588 (included) or R558N for the balancing. Recommended circulator centre distance: 130 mm. From 2 to 7 outlets = R557Y051 cabinet. From 8 to 12 outlets = R557Y052 cabinet.